• Charges have been reprioritized for better understanding of charges by the customer, with base rate preceding other products, and discounts clearly called out prior to subtotal. • Surcharges, Concession fees, and Taxes have been clearly separated from base price and products, allowing for better understanding of the source of charge components. • Final Estimated Charge will continue to be bolded and enlarged to stand out from components as the final amount charged. • Deposit holds will be more clearly marked. • Rental description, including vehicle, rental and return locations, and rental/return times moved to bottom of RA first page, bringing greater clarity by using more customer-friendly language and removing from the body of the estimate of charges. • Charges prioritized to mirror new rental agreement, allowing for easier comparison between initial EOC and Final Charges. 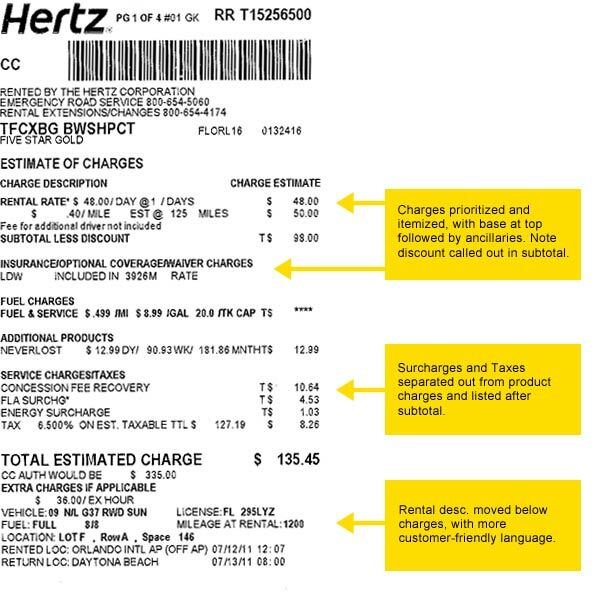 • Additional charges during rental (such as Fuel and Service and Late Returns) clearly disclosed, allowing instant return rep to call out during check in and customer to more clearly see added charges versus the original estimate. • Call to action to review explanation of charges at hyperlinked PDF.